In the summer of 1888, there was uproar on the streets of the East End. 1,400 matchmakers, mostly women and young girls, had walked out of Bryant & May’s factory in Bow and were picketing its gates. This horrified polite society. 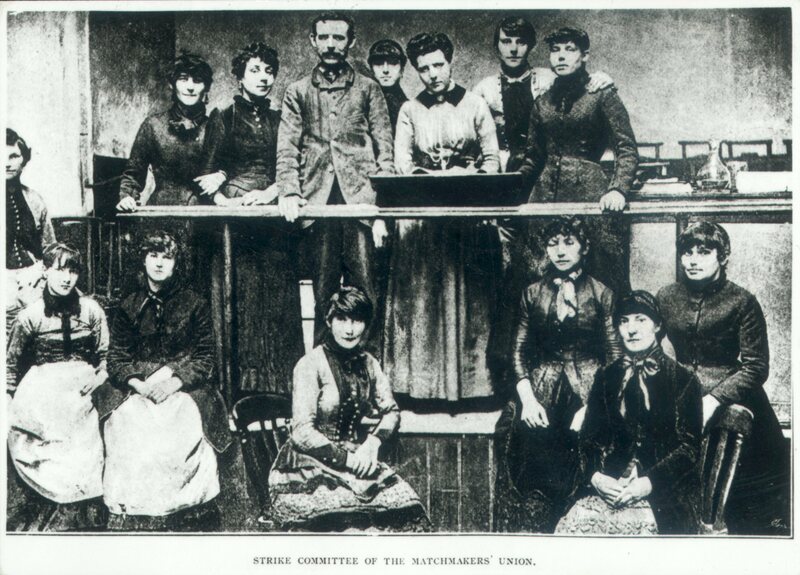 Victorian women, especially working-class ones from mostly Irish families like these, were supposed to know their place. And that place was at home, not in a factory: and certainly not picketing outside one. But these women had been pushed to the limit: wages were so low the youngest girls were actually malnourished. Workers were bullied by their foremen, verbally and physically. Illegal fines were imposed: one woman was fined for modifying a machine which had been cutting workers’ hands. Shortly afterwards a work-mate lost a finger to the same machine; she was cursorily dismissed. White phosphorus, used to make popular ‘Lucifer’ matches, was so toxic even brief exposure to fumes caused vomiting. In full-blown phosphorus poisoning, or ‘phossy jaw’, the jawbone rotted, and pieces of bone the size of peas worked their way out through putrid abscesses. The smell of decay was so unbearable, factory inspectors would find matchworkers dying alone like lepers. These horrors were revealed just before the strike in an expose by Annie Besant, a key member of the Fabian Society, in her paper The Link. As a result of this, Bryant & May blamed her for the strike, despite her strong denials. Studying Besant’s own journals and writings, I found that she was telling the truth: she had only planned a consumer boycott. The firm’s own archives revealed the names of five matchwomen foremen considered the real ringleaders, and evidence of previous strikes. I began to piece together what had really happened. One woman was then sacked as a scapegoat, but rather than being intimidated, her work-mates downed tools and streamed out of the factory gates after her. Six women were elected to negotiate terms to the employer, including the sacked woman’s re-instatement and an end to fines. They met with angry rejection. The women went several days without money, but journalists noted their cheerful solidarity: “…‘I can pawn this for you’, ‘I’ll lend you that’”. This was typical of women already famous – if not notorious – in the East End for their strong sense of group identity, which included their unique image: fringed hairstyles, high-heeled boots, and huge hats trimmed with bright feathers, which they bought and shared through communal ‘feather clubs’. The women put their case eloquently to MPs, and as political pressure mounted, Bryant & May were forced into ungracious defeat in just two weeks. The women’s demands were met, and they formed the largest female union in the country. Nor did they rest on their laurels after their ground-breaking victory. 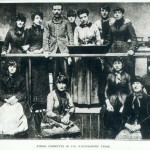 They recruited women from jam factories and confectionery works at union meetings with tea and cake and Irish music. They showed other exploited workers the way, and waves of strikes followed. “…up came the dockers…Then a large contingent of women …match-makers, among others, advanced like a moving rainbow, for they all wore…huge feathers of many colours”. These were the mothers of the entire modern labour movement, and Labour party. The first annual Matchwomen’s Festival will celebrate them with a proper knees-up. Frances O’Grady, TUC leader and matchwoman fan, will speak, as will Tony Benn and Owen Jones. We’ll have music-hall songs, Irish music, a matchwoman’s hat workshop; comics, poets and bands in the evening, and children’s events including readings by Michael Rosen.